The coat racks remain a classic unavoidable, but beyond their functional aspect, they must also participate in your decoration. 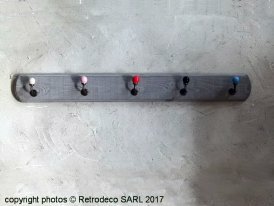 Often neglected, the coat racks win however to be in old wood, metal patinated or well painted with bright colors. You'll find something for every taste with brands such as Chehoma, Ib Laursen, Madam Stoltz, Athezza or Antic Line.